I saw a cover and I was sold. Immediately. It was just love at first sight (and this phenomenon of seeing a book with a very nice cover, followed by getting that book happens a lot to me.) 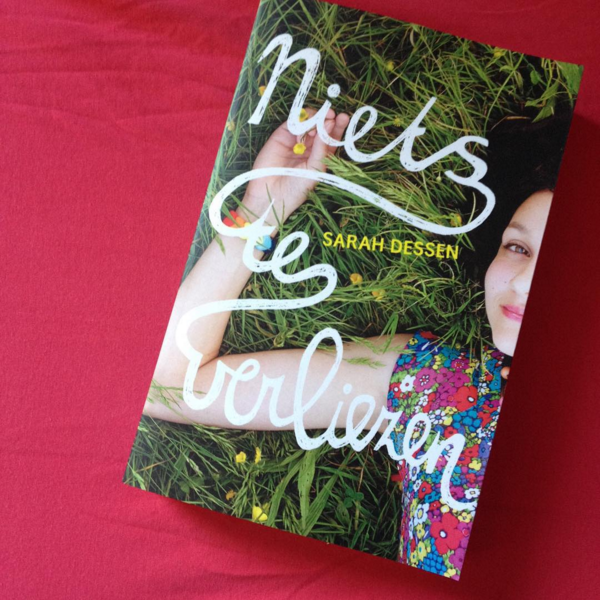 The book I found is in Dutch though but no worries because it’s an English book: What happened to goodbye by Sarah Dessen. Since the divorce of her parents she hasn’t been one person. Living with her father was what McLean wanted because she hated her mother for what she had done. And she doesn’t care if that means she has to move 4 times in 2 years because of her fathers job. For her it only brought opportunities to start all over, with a clean sleeve and a new name. This time the new location is Lakeview, new location? New name. But things didn’t go as McLean had planned and that all because of her neighbor, Dave. She doesn’t know what’s happening to her: she’s being the real McLean, she has a desire to stay in Lakeview instead of moving all the time. She’s longing for a real home. Those feelings only get her confused, this isn’t like her. Not since the divorce but Dave intends to discover the real McLean, to lure her out. Will she let him? 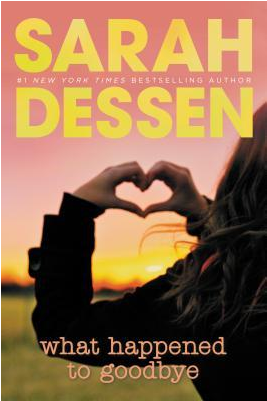 What I love and always have loved about Sarah Dessen’s books is the fact that the girls are always in a bad vibe. They think that they can’t be loved or aren’t supposed to fall in love. And Sarah let’s them follow a path each time which has a light at the end. Then they discover who they really are and what they really feel. Is it love or just friendship who knows with McLean. But I can tell you it only gave me so many pleasant moments in the book and so many cute parts where I literally melted. The end was totally different than I thought it would be, surprising factor? Check. It’s why it left me so stunned and excited at the same time. Can we just take a few breaths. I just finished this read and I feel so empty, like I have to start all over again. This is what Sarah Dessen does to me every time again. Though I also feel happy. I’m just so excited about this book! McLean has had a rough time when her parents divorced, in her eyes all because of what her mother had done. She hates her mother and when she had the choice to go live with her dad she took it with both hands. The only thing that might be a negative point is that she has to move a lot because of her fathers job. Well Negative? This character takes these opportunities for granted. I’ve never read a book with such a character as McLean. Changing names and personalities each time she moves? Original? Check. We get to see McLean when she just arrives in a new town. She introduces us to all the other McLeans there were before and walks us through how this all works out. I liked the factor of that, of introducing us to her previous selves as if it’s normal and meanwhile we get a look into her head. Until Dave comes along. How they meet is special if not very funny. Dave is a genius, handsome, sweet, understanding and can look right through McLean’s appearance. That’s why I love him so much! He doesn’t look just at the outside, he looks deeper and further than all that. He looks at the soul and he falls in love with everything about her. He wants to know the real McLean and intends to find her. Another very interesting character which I loved was Deb. She’s a shy girl, hasn’t had any friends until McLean arrives and decides to make sure Deb has friends. From that moment we get to see Deb a lot more. You’d think this would be plain character but she’s not. She has so much experience with topics that aren’t even close to each which only makes her a very funny and versatile character and I loved her leading role so much. You saw her grow from shy to someone very open and discrete. This book was just as other books by Sarah Dessen, amazing and I surely recommend What happened to goodbye. It might start a little slow but at a point it gets so good and you want to know if Dave will be around and what McLean intends to do, that you keep reading. If you already read what happened to goodbye, I’m sure you’ll enjoy Along For The Ride by her too. So make sure to check both of them out! A fun fact that I discovered in this book is that miss Dessen makes a link to a character from one of her other books which I found a very nice touch.